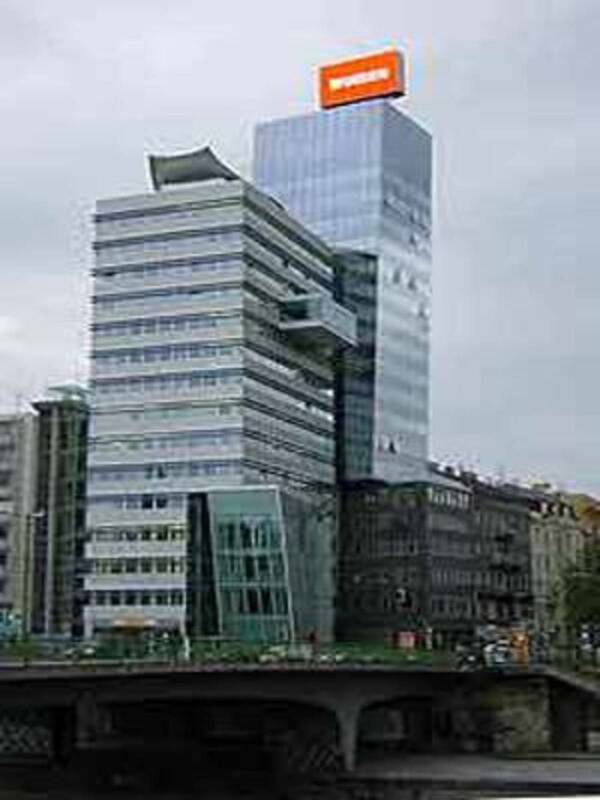 The architect Hans Hollein is responsible for two successful projects that have come into being in 2001: the Interbank Headquarters in Lima and the Generali tower in Vienna. These buildings were erected and inaugurated at the same time, even though they are situated in two different continents, and were a truly unique opportunity for Hollein, whose fame had been overshadowed in the 1980s by great names like Botta, Graves and Rossi. As a result, he had been able to obtain only minor commissions, like a small school in Vienna and some buildings in Leipzig and Potsdam. Then, however, he obtained two unexpected successes: first place in the competition for the Generali Tower in Vienna in 1994 and the one for the Interbank clients in Lima two years later. The skyscrapers were built in totally different urban contexts, yet they have characteristics in common that strongly reflect Hollein's personality. Lima, the capital of Peru, has almost the same number of inhabitants as Austria and has grown up chaotically around a small city centre, that symbolises the independence obtained in colonial times. The Interbank Headquarters is located in the San Isidro district, where a new business hub has grown up. A plot of land situated immediately next to the junction with the most important highway in the area was set aside for this building, attracting the attention of the thousands of drivers who travel along the road each day, since it is perfectly visible even from a distance. Hollein divided the whole complex into two blocks: Tower B is cube-shaped and has six floors housing offices, a cafeteria and the trading room. On the outside it is faced with a series of horizontal fascias of white glass, alternated by ribbon-like windows. Tower A, on the contrary, is a twenty-storey building, that seems to curve forwards like a full-blown sail and is asymmetrical to the lift tower and the stairwell. To underline the "sail" effect, a network of titanium pipes have been installed on the main facade of the building to purposely make it difficult to see how many floors the building has, and creating a characteristic oblique grid; at night, beams of coloured light are projected through the pipes to light up the surfaces.